Still be worrying about so many passwords to remember? 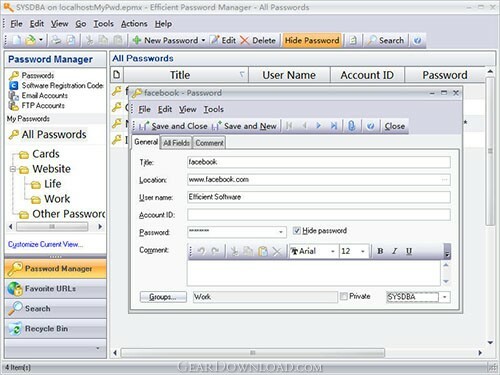 Now we have Efficient Password Manager Network, a powerful and unique password management package. She can not only help you remember general password information, but also record website login passwords, software registration codes, e-mail account passwords, or even passwords for your FTP accounts, etc. A random password generator is integrated which saves your time meditating for passwords. Actually, the passwords generated by this tool are usually safer. Your private information is fully protected - the main login password is encrypted by the irreversible SHA algorithm, while the password information itself is encrypted by 256-bit AES algorithm, the encryption strength of which is among the highest in the world. The software also offers many special features such as password management in hierarchical grouping, adding attachments to password entry, setting record importance, displaying record list in card view. Besides, with network edition, different users in your organization can access the same copy of data, to work in conjunction and improve work efficiency! Atomic Asterisk Cracker 1.10 - Asterisk Cracker is designed for the hidden with asterisks fields scanning. Aqua Deskperience 1.3.14 - Copy/Paste unavailable?Capture any text visible on the screen with a hot key. Atomic Mailbox Password Recovery 2.90 - Recovers passwords to mail boxes of any e-mail client in less than no time. SpotAuditor 5.2.1 - SpotAuditor is password recovery software, recovers over 40 programs passwords.